The Mira smart bracelet, which has just hit Kickstarter, is affordable, stylish and tracks fitness without getting in the way. In short, it ticks all the boxes for a female-friendly wrist based wearable. It’s Mira’s simplicity that is already winning over crowdfunding fans. The smart jewellery tracks steps, distance and calories burned with a neat circular graphic in the companion iPhone app. A purple block gets bigger the more you move for glanceable hour, day and week views. We’re not sure if there’s any sleep tracking functionality yet, or what materials the Mira is made from at this stage - we'll update as and when we find out more. Mira isn’t aimed at fitness fanatics. Instead, the iPhone app displays Boosts to encourage users who sit around all day to build some walking or exercise into their schedules. These messages are tailored to the user’s activity levels and include funny bits like ‘sweat is fat crying’ plus suggestions for activities. All with exclamation marks in that very enthusiastic, American, go get’ em style - but it could be just what it takes to get couch potatoes up and about. And okay, it’s not a bracelet to swoon over like the luxury Opening Ceremony and Intel collaboration MICA or Tory Burch’s rose gold-coloured, stainless steel accessories for the Fitbit Flex. But the Mira does look more inconspicuous than most of the plain black or sports-bright smartbands on sale at the moment and would blend in with regular dumb jewellery. 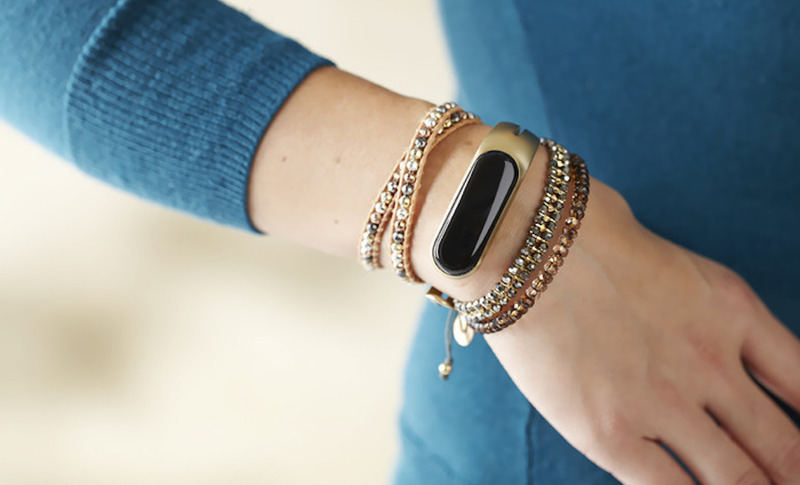 Just a quick warning - this is not a cheap, stylish smart bracelet for all wimminkind. The tracker itself is detachable and interchangeable between the two midnight purple and brushed gold styles. It also comes in three sizes - petite, small and medium. But the Kickstarter page states that deliveries are US only which is a real shame, only the ‘small’ size is available at launch and there’s no sign of Android compatibility in the video or images. There’s no word yet on plans beyond Kickstarter so we could see a wider release once Mira has fulfilled its initial orders. Incredibly, the team plans to start sending out units as soon as January. They better get cracking. Live in the US and use an iPhone? You can buy a Mira straight from the Kickstarter page for an early bird price of $149, a saving of $20 on the estimated final price of $169. And with $3,800 down on its modest $10,000 Kickstarter target, we’re going to wager that the project will smash that by 5 January.